As a parent of a gymnast have you ever wondered what your child’s coach would say to you if there were no holds barred? Have you ever questioned whether your enthusiasm, involvement or interest is seen as helping or hindering? We asked a former professional coach to spill the beans. Read on if you would like to know what one coach REALLY felt like saying to parents! How involved a parent chooses to become in their child’s gymnastic career varies enormously. Some of my gymnasts’ parents would simply drop their child off at the door of the gym and pick them up again once the session had finished while others wanted to be there for every stage of the journey. As you are reading this, the chances are you fall into the latter category and if so, great. Every coach understands that a parent wants to see their child succeed in being the best they can be; after all, many of us are parents ourselves. However, there are things you can do as a gymnastic parent which are helpful and supportive but there are also those which qualify as interference or even behaviour which will have a negative impact on your child’s chances of success. So, what constitutes a great gymnastic parent and what defines a nightmare one? I myself – along with every coach who has been in the sport for a while – have known both varieties; those that have made my job easier and those who managed to get my back up at every session. Here is a list of some of those dos and don’ts which might help you towards being the kind of parent coaches love to have around while ensuring you are offering the best support possible to your child. While the viewing areas in many gyms are totally sectioned off, the set up in others positions parents and training gymnast within talking distance of each other. Such a situation is rife with problem potential. Please do not coach your child from the sidelines or even offer any kind of suggestion. Even if you feel you understand gymnastics you might find yourself giving instructions contrary to those given by the coach and this places your child in a terrible situation. At best they will feel confused and torn between doing what their coach says and what their mum/dad says. At worst they will be distracted and unable to perform at their best and such lapses in concentration can be dangerous in the gym. As a coach I have even been distracted myself by such interference. All your child needs from you with regard to feedback or reaction while in the gym is a solid occasional thumbs-up or a big smile. It is perfectly normal for a gymnast to want to practice some newly learned basic skills at home and many coaches, myself included, encourage this. If this sounds like your gymnast by all means give encouragement and support but don’t attempt to ‘coach’ them or correct mistakes. You may even have been a gymnast or coach yourself and feel pretty confident about giving instruction but approaches vary from coach to coach. There are not always clear rights and wrongs. Sometimes the thinking even changes completely about how things are done over a period of time. 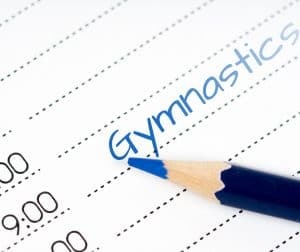 As a parent you will of course have ideas, wishes and plans for your child’s gymnastic training schedule and even perhaps longer term career if your child is talented. However, it is quite possible your thoughts on this may differ – sometimes significantly – from those of the coach. At these times try and remember the coach is the expert. For example, if a coach says your child is not ready to move up a level or take part in a competition try and respect that decision. Of course coaches are not gods and they are not always right. Like anything in life there are good ones and bad ones. If you find yourself disagreeing over and over again with a coach’s decisions it is perhaps time to look for another gym and other coaches. Late arrivals to a class are highly disruptive for everyone in the group and can be embarrassing for the child themselves. If this happens in classes of younger gymnasts it is most disruptive of all. Beginner gymnasts can’t be left to do warm-ups on their own which means taking up the time of a coach for a 1:1 warm-up or alternatively the child misses part of the warm-up. This latter can lead to the child falling behind or even injury. You might just be having a bad day or you may genuinely feel the need to vent something negative about a coach, the gym or another gymnast/parent and you may even be justified. However, never voice any of this in front of your child. If they should hear negative comments about the person teaching them it could undermine their confidence in their teacher, negatively impact on respect and ultimately affect how they learn. If you have a genuine gripe then speak directly with the coach or in the worst case scenarios remove your child. Gymnastics can take-over especially where a talented child is making great progress. There is nothing wrong with committed focus but to exclude everything else so that the child becomes solely and only a gymnast means running the risk of an unbalanced identity. In such cases, if the worst should happen and the child is forced to quit the sport, it can be hard to find a personality, life or focus beyond what has been lost. Gymnastics is a great sport for gaining supreme fitness, improving co-ordination, learning life skills and having lots of fun. For the majority of children this is all it will ever be. Perhaps in the bigger picture these are the most valuable things the sport can offer. So, try not to get too carried away imagining what else it could be and then wishing and hoping for that, even if your child is extremely talented. I always understood the need for – and actively encouraged – occasional face-to-face time with a parent to deliver feedback on progress. However, there were always those parents who wanted to talk to me before and/or after every session. This begins as something which irritates but in the end led to me going out of my way to avoid these parents. Like most coaches, if I had something significant to discuss I would go to the parent myself. Avoid taking up your child’s coach’s time in this way and allow them to get on with what they are supposed to be doing – helping your child become the best gymnast they can be. If your child is going through some kind of home-life crisis your coach should know. Such things as the separation of parents, death or serious illness in the family or with a family pet and school problems can have profound emotional impact on a child and will almost certainly affect their moods, behaviour and concentration. Once armed with this kind of information a coach can make the appropriate allowances. ‘We have been practising at home’……’we were wondering how soon we would be moving up a level’………. do you use sentences such as this when talking to a coach? Every time I heard something which included the ‘we’ I would wince. Use of this pronoun was almost always a sign that the parent was somehow trying to live out their own expectations and dreams through that child. They are usually the same parents who push their child to practice or condition at home without any coach say-so. To be involved, interested and supportive of your child’s choice of sport is wonderful. But remember this is their experience and not a vehicle through which you can achieve your dreams. There are very few children who don’t seek some level of approval from their parents (even the sulky teenage ones!!) If you watch your child train or compete it is almost certain you will find them glancing your way for reassurance, comfort and ultimately approval. Your role here as a supportive parent is to smile and offer a thumbs up whether they have just nailed a difficult move or fallen on their backside in a competition. Things to avoid are promising elaborate rewards for achieving goals or withholding of privileges for failing to do so; threats to remove them from the gym; pressuring them to train/push themselves/achieve; displeasure displays, sulking or acting cold towards them if they have failed to perform to your expected standard or otherwise trying to motivate them in any way through fear or negativity. Sad to say I have witnessed all of these. The best role you can play as a parent of a gymnast is that of cheerleader.